The key to this Courgette and Pine Nut with Fresh Pasta Recipe is doing all the preparation first so everything is ready before you start cooking. Bring a large pot of salted water to the boil, as the fresh pasta takes just a couple of minutes to cook. Melt a good knob of butter and a tablespoon of olive oil in a large pan or wok and gently cook the pine nuts for a couple of minutes until they just start to colour. 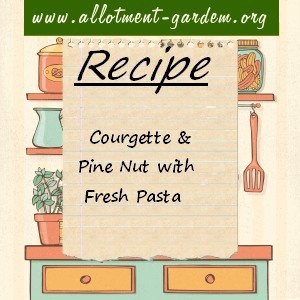 Throw in the courgettes and basil and turn up the heat slightly but make sure everything keeps moving and the pine nuts don’t catch. The courgettes want to be slightly soft with the juices mixing with the butter and oil to make the sauce. Meanwhile, add the pasta to the boiling water, bring back to the boil then turn down heat to a gentle simmer. Cook for two minutes, then drain and divide between the plates. Put the courgette mix on top, grate the Parmigiano-Reggiano over according to taste and serve.